Thunder Bay's Chronicle-Journal reports Northern Ontario's Fort William CC is about to embark on a $350,00 renovation to make the facility completely wheelchair accessible. The club will host the 2012 Canadian National Championships. Last week's Ford Men's World Championships in Moncton, NB, included a demonstration of wheelchair curling between the medal games. Team Nova Scotia members Laughie Rutt and Mike Fitzgerald participated, as did Scots skip Michael McCreadie. Need a new sports wheelchair? RGK, a UK wheelchair manufacturer, is offering discounts of up to $3,000 on the purchase of a new wheelchair in a program initiated by Chris Daw through the CCA's Discover Curling program. RGK wheelchairs are carried in Canada by MEDIchair and possibly others. Conditions will probably apply but if you want more information, email Chris Daw. Bruce Cameron's rink's efforts over the season competing in the RA Club's Monday Mixed League was capped by going undefeated in the final round of "A" division to win the trophy. He played with Doug Morris, Jamie Eddy and Christine Lavallee. Had a successful season? Let us know. The more people understand that club wheelchair teams can be competitive, the more likely clubs will be open to participation by wheelchair users. Keen observers of this blog will notice that the post about towing has been removed. It was based on a sincere remark by someone I know who drew a parallel to golfer Casey Martin. The overwhelming consensus of comments was that the comment was stupid and that I was even more stupid for posting it. Fair enough. It also provoked many abusive personal comments, so I think that at least for a while I am going to change the blog's comment settings. You will now need to provide an OpenID to post here. OpenID's are easy to get. You very probably already have an online identity that will work as an OpenID. Click on the link for more information. Participation in wheelchair curling in Canada is paltry considering the number of venues and the number of wheelchair users able to curl. The most pressing issue is how to increase participation, and the CCA has TSX and other funding to help make that happen. Most efforts thus far have been what I consider retail operations; one-off give-it-a-go days and clinics. These have value to the individuals who hear about them and are inspired by the skills of the presenter to take up the sport. But without a follow-up plan and a committed person mentoring a nascent program, these clinics have a short shelf life. We need funding spent at the wholesale level, establishing what is needed for wheelchair curling to take root and providing resources that can be applied across the country. There are current plans to give all curling clubs information to encourage them to include wheelchair users. To get wheelchair curling started in a new location, there needs to be someone there who is determined to make it happen, and who will organise the resources (ice-time, equipment, coaching, sponsorship etc) necessary for a program to develop. There are lots of examples where this has happened. 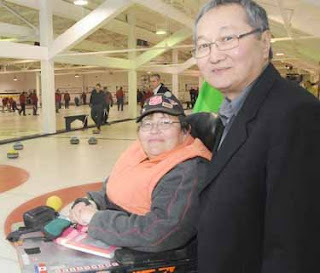 Al Whittier at the Lennoxville CC in Quebec, Dave Kawahara in Northern Ontario, Ernie Comerford in Calgary (I know there are others) all came fresh to wheelchair curling and created something that will last beyond their personal involvement. So how do we reach those people who will be the necessary catalyst for growth? In my opinion you begin by putting one wheelchair out on the ice, and you make that happen by publicising that possibility to Canada's club curlers. Get one wheelchair user to participate at a club, and you will have the club membership recruit others. Get three of four wheelchair users and you will attract the attention of people interested in coaching. 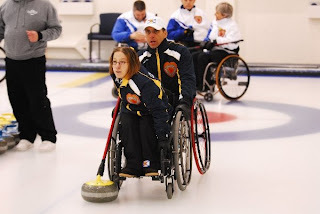 Get a nucleus of players and you can begin to publicise them in local media, raise sponsorship money and start outreach, which is far easier to do if there is something, however small, that a recruit can attach themselves to, rather than be sold the idea of wheelchair curling and then be left wondering what to do next. What I am suggesting is there is a proven process which needs to be replicated across Canada. Shipping in outside experts, while easy to do and easy to organise, comes after necessary groundwork is laid. I remember a high performance coach, at the end of a long weekend of curling strategy, psychology, team dynamics, fitness and nutrition and much more, saying "Of course, if you can't make your shots, none of this matters." Throwing a stone with the right weight in the right direction with the right rotation depends on technique, and while with wheelchair curlers technique will depend on their individual available muscle sets, it can be taught, practiced and improved. Good technique is not about a type of delivery. It is about working with your body and not fighting your body, or your wheelchair. Poor technique begins with a curler's first attempt to get a stone all the way down the ice, where the effort to throw hard enough never allows a controlled repeatable and dependable delivery to develop. This is why wise heads like Scots skip Michael McCreadie suggest not throwing from 120 feet until you can push a stone accurately 20, then 40 then 60 feet. Evaluating technique and understanding enough about kinesthesiology to be able to suggest improvements is, I suspect, more than most coaches feel comfortable tackling. There was certainly a lot of really poor technique on display at the Nationals, and not just by the inexperienced teams. So the biggest single thing that an ambitious wheelchair curler can do is to examine their delivery. Are they using a pendulum delivery when they have the strength to use a more compact and stable piston delivery? Are they anchoring their off-side hand in a way that twists their body when they throw? Would an off-side brace help keep their shoulders square through delivery? Would angling the chair make them more accurate throwers, or lengthening their sticks or adding an angled hand grip to their delivery stick? The principle here is that the harder you throw, the more likely it is that your delivery will break down unless you have developed an accurate delivery to which you have gradually added more weight. Once you have mastered weight, direction and rotation, then you can start worrying about subtleties of strategy and tactics. Jim Armstrong certainly has the potential to advance skills like ice-reading and shot calling. Most players are nowhere near the skill level where that would be more than of academic interest. For most teams, getting five or six rocks somewhere in the house will win most of the time. Having a widely recognised name may help spur interest in what you have to say, but the trick is knowing what needs to be said if lasting improvement and change is to be made. There are lots of potential mentors, but first let's concentrate on getting more clubs to accommodate wheelchairs, and then let's improve technique so that our stones' destination becomes less of a guess. One of the reasons that I mirror the content of the wheelchaircurling.com website on this blog is to provide a forum for others to comment. I enjoy reading the comments so keep them coming. Occasionally I will add a comment of my own if I feel I have something constructive to say. If I haven't replied to an anonymous comment it's either because I don't feel strongly enough about the issue to express an opinion, or because I prefer to know who I am talking to before I reply. So if you have a specific question that you would like me to answer, the best way to do that is to email me at eric@wheelchaircurling.com. Photographer Ian Readey took many photos throughout the five days of competition and you can see them on his website. I have made a small selection of my favourites and have posted them HERE. This year's Sportsmanship Trophy was awarded through player ballot to Nicole Durand, Lead on Team Nova Scotia and her photo is below.